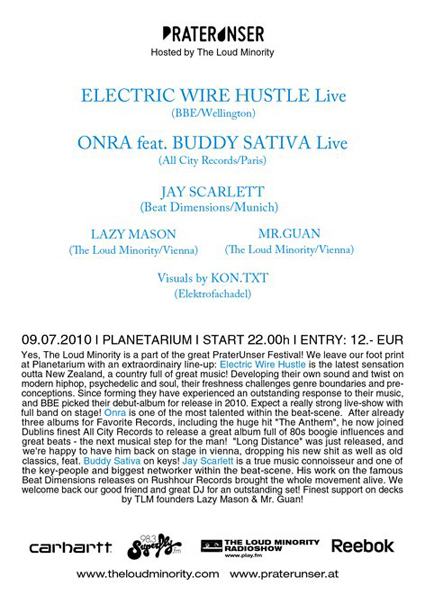 In the name of the second Prater Unser Festival the Loud Minority folks invited Electric Wire Hustle (picture above) from New Zealand to perform for the first time live in Vienna. The brisk trio from Wellington presents psychedelic HipHop with much Soul in his heart in order to solicit their upcoming debut longplayer on BBE. The other highlight of the night is Onra from Paris. The young producer already caused a stir with his hit The Anthem. In Vienna he will also present his upcoming album which is loaded with thrilling eighties Boogie beat science. After the concerts the DJs Jay Scarlett, Lazy Mason, and Mr. Guan spin hot Soul, Funk, Jazz, and HipHop rhythms in order to make you sweat at the marvelous Planetarium party location.